Things move in many ways, and inspiration is just another that does so. After leaving school I found that I worked almost 100% in function ware for some time only recently moving to decorative pieces again even though they were pottery rather then sculpture as was my former love. However after a bit of inspiration again I have found the interest to bridge the gap again and explore both pottery and Sculpture again. While also working with some mixed media elements at the same time. While I still work with the form I have been drawn to Asian techniques and forms for some time. This simplicity gave me an outlet for creativity yet contemplation of form. Though while researching I found myself stumbling repeatedly on a technique i have seen often in Asian works. 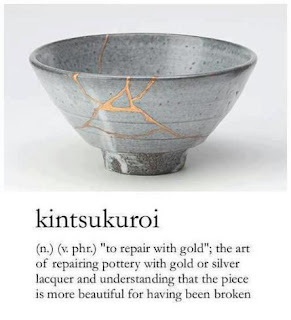 This technique is the process of repairing pottery but rather then trying to downplay the damage the repair work is highlighted in gold, or another precious metal. This often takes a simple form and makes it even more beautiful. Not only because the lines are aesthetic but it shows that care was given to the piece. Rather then disposing of a broken pot someone cared enough to repair it and using gold to do so. We all are made up of many things, though the ones that make us who we are the most tend to be the things that we think of as mistakes. Things that have damaged our pride, spirit or body. But these are also the thing that make us strong and thereby let our true self and beauty show. Clay may be beautiful when on the potters wheel but it must go through fire before it becomes strong enough to withstand the it's surroundings. This is what has inspired my new body of work. I will be working first with human faces, then expanding though while i am not using the same techniques as Kintsugi rather then using Lacquer I have experimented with casting the metal into my work and am also looking to other methods of using sterling silver and other metals. While only one mixed media piece has been completed others are in the works and hope to soon be added to my gallery. While the first is scheduled to debut in a few days in a local juries show.